ICLEI USA and EnergySage have partnered to offer a simple solution to go solar and save money! ICLEI is a global network of cities, towns, and regions committed to building a sustainable future, offering solutions to local governments to meet their sustainability goals. ICLEI USA is proud to partner with EnergySage to make its Solar Marketplace available to residents and businesses to help them learn about and shop for solar energy systems! EnergySage is funded by the US Department of Energy and is owned, in part, by the Massachusetts Clean Energy Center, a quasi government organization that works to advance renewables adoption. Researching and shopping for solar can be a confusing and time-consuming process. 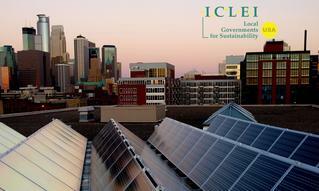 The ICLEI Solar Marketplace helps to deliver transparency, simplicity and choice to those interested in exploring solar. The Solar Marketplace is an online platform that helps residents quickly research and shop for solar energy systems. Free tools and resources are available to help answer your questions and provide assistance in comparing options, so you can make an informed decision in going solar. Most consumers are able to save considerably on their solar project through EnergySage! Get started today! "We have partnered with the EnergySage Solar Marketplace to connect our residents with a network of pre-screened contractors in the solar market. The Solar Marketplace works as a ‘solar search engine,’ providing multiple solar quotes, calculating the financial merits of each offer, and presenting them in an easy-to-understand format. The Solar Marketplace is a great tool to assist our residents in their decision-making to go solar."